Education spending and teacher pay has become a big issue in certain states. Unfortunately, not for the right reason. In an ideal world, taxpayers would be demanding systemic reform because government schools are getting record amounts of money (higher than any other nation on a per-student basis) while producing sub-par results. Instead, we live in a surreal parallel universe where teacher unions are pushing a narrative that taxpayers should cough up more money because teachers supposedly are underpaid. An article in City Journal debunks the claim that teachers are underpaid. …protests across the country have reinforced the perception that public school teachers are dramatically underpaid. They’re not: the average teacher already enjoys market-level wages plus retirement benefits vastly exceeding those of private-sector workers. Across-the-board salary increases, such as those enacted in Arizona, West Virginia, and Kentucky, are the wrong solution to a non-problem. …At the lowest skill levels—a GS-6 on the federal scale—teachers ear n salaries about 26 percent higher than similar white-collar workers. …The average public school teaching position rated an 8.8 on the federal GS scale. After adjustment to reflect the time that teachers work outside the formal school day, the BLS data show that public school teachers on average receive salaries about 8 percent above similar private-sector jobs. …Data from the Survey of Income and Program Participation show that teachers who change to non-teaching jobs take an average salary cut of about 3 percent. Studies using administrative records in Florida, Missouri, Georgia, and Montana showed similar results. …public-employee retirement and health benefits are bleeding dry state and local budgets. Neither the public nor teachers fully appreciates the costs of these programs. We forget the value of benefits when considering how teacher pay compares with private-sector work. And keep in mind those lavish pensions are woefully underfunded, so taxpayers are paying too much now and they’ll have to pay even more in the future. But I think the key factoid from the above article is that teachers take a pay cut, on average, when they leave the profession. Along with the “JOLTS” data, that’s real-world evidence that teachers are getting paid more than counterparts in the economy’s productive sector. Allysia Finley of the Wall Street Journal also punctures the false claims of the union bosses. Teachers unions… They’re using misleading statistics… They conflate school funding and state education spending. In Oklahoma, unions proclaimed that per pupil school spending fell by 28.2% over the past decade. That refers to the inflation-adjusted state’s general funding formula. But total per pupil outlays increased by 16% in nominal terms between 2006 and 2016… They use elevated spending baselines. Teachers unions nearly always compare school spending and teacher salaries today with peak levels before the great recession, which were inflated like housing prices. Between 2000 and 2009, average per pupil spending across the country increased 52%…per pupil spending ticked up by 7.5% between 2012 and 2015. School spending growth…increased faster than the consumer price index. …They don’t account for other forms of compensation. Since 2000, per pupil spending on employee benefits has doubled. …pensions and health benefits are the fastest-growing expenses for many school districts, and most of the money goes to retired teachers. …the unions are lying with statistics. In a column for the Denver Post, a parent showed that his state’s teachers are getting above-average compensation. Teachers are…mostly paid via a union “salary schedule,” meaning they get pay raises based on only two factors: the number of college degrees and certificates they earn, and how many years they’ve been on the job. That makes a pretty lousy incentive structure… We keep hearing Colorado is 49th in the country for educational spending. That lie is repeated so often it becomes legend. Funding for Colorado schools are split between the local school district and the state. So, if you compare only the state funding part to states that have no local match, yep, ours looks low. But when you look at total funding, which can be counted in different ways, the picture doesn’t look so dire. …According to the Colorado Department of Education, the average salary for teachers here is $52,728. But that’s only one piece of the compensation. The school year is about 180 days, or 36 weeks. So, the pay is $1,465 for every week a teacher is teaching. Vacation time? Well, 52 weeks in a year, minus 36 weeks in the classroom, that’s 16 weeks off, roughly 4 months! Compare that to someone who only gets 2 weeks off but still gets paid $1,465 a week when working, that’s the equivalent of $73,233. And let’s count the present-cost value of their retirement benefits. …Not bad for a system where you can retire at 58. Let’s close with some excerpts from Jason Riley’s column in the Wall Street Journal. The nation’s K-12 schools are…turning into hotbeds of political activism. …teachers are demanding higher pay, better benefits and more education funding overall. …The American Federation of Teachers and the National Education Association have thousands of state and local affiliates. They are among the richest and best-organized pressure groups in the country. And they are on a roll. That’s good news for their members but not necessarily for children, parents and taxpayers. …Teachers unions support work rules that prevent the most capable teachers from being sent to low-performing schools, that shield teachers from meaningful evaluations, and that require instructors to be laid off based on seniority instead of performance. …those rules do nothing to address the needs of students. …politicians love to highlight education outlays. It helps them win votes and ward off union agitators. But the connection between school spending and educational outcomes is tenuous. …total spending per pupil at the state level rose, on average, by an inflation-adjusted 18%. During this period, it fell in Arizona… Yet on 2015 federal standardized exams, Arizona made more progress than any other state. New York, by contrast, boasts the highest spending per pupil and teacher pay in the country, but you wouldn’t know it from the test results. For what it’s worth, the final few sentences in the above excerpt should be main issue being discussed in state capitals. Lawmakers should be asking why more and more money never produces better outcomes. But that’s really not the problem. It’s the symptom of the problem. Our primary challenge in education is that we rely on government monopolies that are captured by special interests. 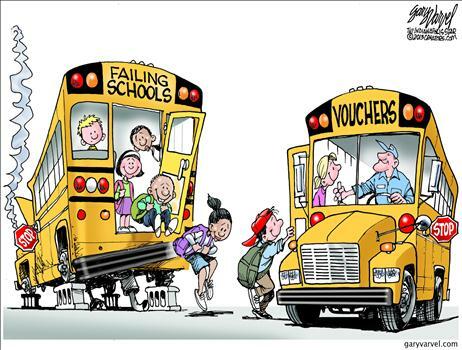 We need school choice so that competitive forces can be unleashed to generate better results. There’s strong evidence that choice produces good outcomes in the limited instances where it is allowed in the United States. And in that kind of system, we may actually wind up with better teachers that are paid just as much. Or maybe even more. P.S. There’s also strong evidence for school choice from nations such as Sweden, Chile, and the Netherlands. P.P.S. Needless to say, eliminating the Department of Education is part of the solution. Are there teacher shortages because the unions won’t budge on reducing unaffordable retirement benefits? i.e., retirement benefits crowding out the appropriate headcount. Your point about second job means little. The teachers I’ve known work second jobs because they have summers off. Other professions don’t have that block of time off, so not a fair comparison. – Not a teacher (but have been and family in it). – One of my PhD major is in stats…..
– it’s a win win! Reality is reality. Fifty percent of teachers quit before 5 years. Teacher shortages are now being seen and projected to increase exponentially. 10% of teachers hold a second job – higher than most other full time professions. Explain their great fiscal situation to these facts. Teachers’ Unions, the same problem in my country, all of them filthy commies.